All equipped with either 2-wheel drive or 4x4 drivetrains, with gasoline and diesel engines, including 1/2-, 3/4- and 1-ton pickup trucks. 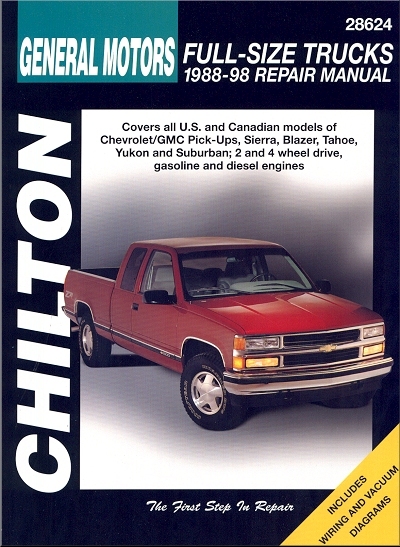 The 1988-1998 Chevy Truck motor manual published by Chilton and available at The Motor Bookstore gives the owners of full-size General Motors trucks including the Sierra, Blazer, Tahoe, Suburban and Yukon an invaluable resource that will help them undertake maintenance and repair of their vehicles themselves. Everything from a wiring diagram for 1994 GMC Sierra truck to general battery maintenance is covered in this detailed 328-page manual filled with diagrams and photos to make DIY repairs a snap. Also covered in the manual are tips on the cooling, heating and air-conditioning systems, manual and automatic transmissions, rear axle, brakes, the driveline, the clutch, the transfer case and more. Place an order with The Motor Bookstore and your book will come with free shipping to the 48 contiguous United States. Always keep the battery cables and terminals free of corrosion. Check and clean these components about once a year. Keep the top of the battery clean, as film of dirt can help discharge a battery that is not used for long periods. A solution of baking soda and water may be used for cleaning, but be careful to flush this off with clear water. DO NOT let any of the solution into the filler holes. Baking soda neutralizes battery acid and will de-activate a battery cell. Batteries in vehicles which are not operated on a regular basis can fall victim to parasitic loads (small current drains which are constantly drawing current from the battery). Normal parasitic loads may drain a battery on a vehicle that is in storage and not used for 6-8 weeks. Vehicles that have additional accessories such as a phone or an alarm system may discharge a battery sooner. If the vehicle is to be stored for longer periods in a secure area and the alarm system is not necessary, the negative battery cable should be disconnected to protect the battery. Remember that constantly deep cycling a battery (completely discharging and recharging it) will shorten battery life. A great and comprehensive repair shop manual for the do-it-yourselfer who wants to maintain or service his own vehicle. Proper maintenance and tune-ups are the keys to the vehicle's long and trouble-free life. Studies have shown that a properly tuned and maintained vehicle can achieve better gas mileage when compared to an out-of-tune vehicle. The Motor Bookstore offers a 30-day money-back guarantee on all Chilton manuals, so you can make your purchase with confidence. Ask a question about Chevy, GMC Pick-ups Repair Manual 1988-1998. I have a 1992 Chevy Silverodo &amp;amp; have had a Haynes repair hard copy since I bought the truck new in 1991, Still on the road with it, Now I just purchased a Chilton manual for it because I used to have a 1972 Monta carlo &amp;amp; the book was very thick and very useful &amp;amp; detailed very good, Still have it somewhere no longer have the car though. Helpful source for where and what to look for when problems occur. Not as detailed as I had hoped, but has plenty of good info. Item was very useful in helping to repair and maintain my 1991 Chevy P/U. Fast shipping but the book is not worth buying. I guess I am used to the Bentley Manuals for the BMW's, Jags, MB, etc. I also have the Haynes Manual for this Chevy, and between the two and the Internet, I could do what needs to be done. To be fair, Chilton was one of the best back in the '60s - '70s, but with the advent of Online sources, they have not really been able to compete. My Bentley is almost 20 years old, I don't know how their newer publications are, but I still like the look and feel of paper - along with grease smudges on them, Old School, I know. Although the book is very informative for some aspects of the vehicle it does not address all aspects. I purchased the book because I was looking to remove the dashboard and work on the ventilation system. Much to my surprise this book addresses none of that. Unfortunately, this book glosses over important information needed to properly perform a task. Too many instructions just say remove the bolts and move the part out of the way. They don't mention how many bolts and their location, which on many parts would simplify their removal. The other complaint is that you really have to dig to find the info you want. Too much of it is buried in the rebuild engine section, which keeps you page hopping. It does have tips and warnings on most procedures, which is helpful. Now he can do it! It makes it so my grandson can work on his own rig!!! !